LUNE where style meet comforts brought you special Linen’s clothing for ladies, the linen material is well known for comfort and clean. P.G. Martin Luggage brought you a special trade in offer of 15% off on your new suitcase and 20% off on your second new suitcase purchase against your old suitcase of any brand at any condition. Turret and Urbertrendz brought you a special promotion of 25% off on UNITED COLORS OF BENETTON new arrival men’s, women’s, kid’s clothing and accessories until 12th April 2018. 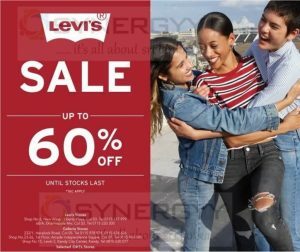 Levi’s Store Colombo announces a special promotion of discount up to 60% for Levi’s Clothing and accessories. The offer is valid only up to the stock last and terms and conditions applied. Visit Levi’s Store Colombo on 68/A Dharmapala Mawatha, Colombo 3 or Shop No 6, New Wing, Liberty Plaza, R.A De Mel Mawatha, Colombo 03. 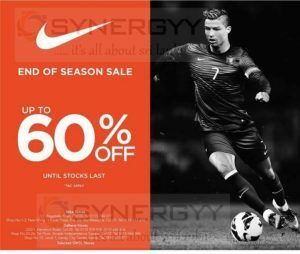 Nike Store Colombo announces a special promotion of discount up to 60% for Nike Clothing and accessories. The offer is valid only up to the stock last and terms and conditions applied. Visit Nike Store Colombo on 1/1 Bagatalle Road, Colombo 3 or Shop No 1-2, New Wing, Liberty Plaza, R.A De Mel Mawatha, Colombo 03. 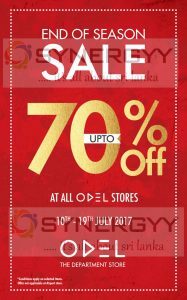 ODEL announces their end of season sale with discount upto 70% on range of clothing and accessories in this season. The offer valid at all ODEL store and offer valid until stock last. 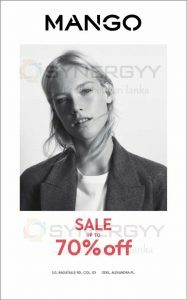 Mango leading apparels and accessories store in Colombo announces a special sale of 70% off for this send of season. 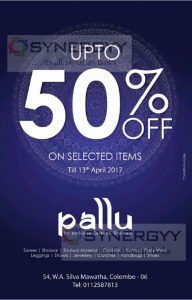 The promotion valid still stock at last and only on 1/1, Bagatalle Road, Colombo 03 and ODEL at Alexandra Place. 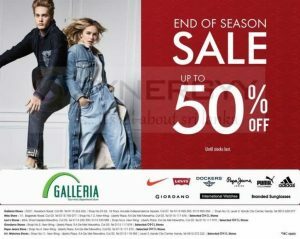 Galleria announces a special end of season sale and grasp discount upto 50% on range of branded clothing and accessories. Galleria brought you appeals of Nike, Levis’, Dockers, pepe jeans, puma, Adidas, Giordano. International watches and Branded Sunglasses. 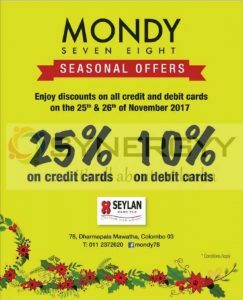 Mondy announces a special discount for seylan bnk credit and debit card on 25th & 26th of November 2017 at Mondy Showroom at 78, Dharmapala Mawatha, Colombo 03. India’s most loved fashion showcase is back to Colombo on November 6,7,8th,2017 at Cinnamon Lakeside Hotel from 10.00 Am to 8.00 Pm. The city of Colombo has always played the perfect host to hi Life. 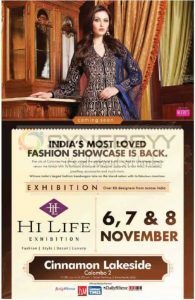 And Hi life always loves to return the favour with its fantastic show case of designer apparels, bridal wear, trousseaus, jewellery, accessories and much more. 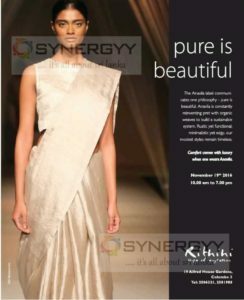 Witness the India’s largest fashion bandwagon take on the island nation with its fabulous creations with more than 80 designers from across India. 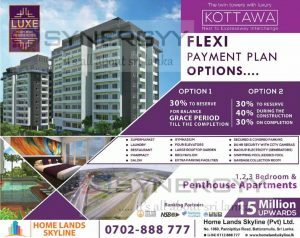 Luxe Highway Residencies is a twin towers with luxury condo coming up at Kottawa near to Expressway interchange. 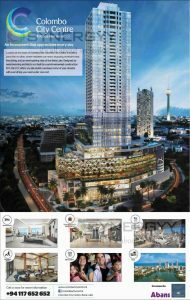 30% to reserve, 40% during the construction and Balance 30% on completion. 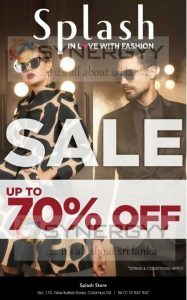 United Colors of Benetton announces a midyear sale of 20% off on clothing of Men’s, Women’s, Kids’ and Accessories. The promotions valid for certain period of time and available only on Colombo Flagship stores at 64, Darmapala Mawatha, Colombo 03 and Kandy City Centre, Level 3, 6B, 5 Dalada Veediya, Kandy. 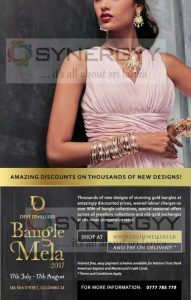 Devi Jewellers announces an amazing discount on thousands of new designs of stunning gold bangles at amazingly discounted prices, waived labour charges on over 90% of bangle collections, special seasonal offers across all jewellery collections and old-gold exchanges at the most competitive rates! Interest Free easy payment schemes available for Nations Trust Bank American Express and Mater Card Credit cards. Adidas announces a special sale till 31st July 2017 and discount up to 35%. 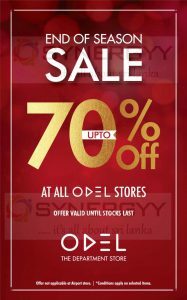 Enjoy discount upto 70% in this end of seasonal sale from ODEL. The promotions are valid from 10th to 19th July 2017 at all stores other than Airport Store. Visit ODEL today and enjoy shopping of your favourite clothing and apparel at lowest price available in city and less burden to your wallet. Softlogic announces a grand clearance sales for the leading branded clothing, footwear, luggage and watches at a very lowest price on 9th to 11th June 2017 from 10am – 9pm at Women’s International Hall, Colombo 07. Cotton Collection Plus announces a special discount upto 50% on selected items on this new year seasons. Visit to the new Cotton Collection Plus showroom at No 40, Flower Road, Colombo 07 and experience range of branded clothing’s for Plus size men and women. 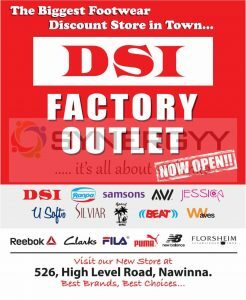 DSI announces and open up the biggest footwear sales in town at DSI new Showroom at Nawinna. 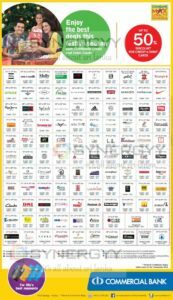 Visit today and enjoy range of branded footwears of Reebok, Clarks, Fila, Puma, New Balance, Florsheim, Waves, Beat. DSI, Silviar, U Softo, Jessica, Samsons, Ranpa. 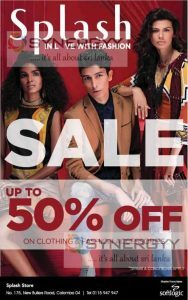 Splash a leading clothing outlet in Colombo by Softlogic group announces special discounts for this off season up to 50 % off on Clothing and Fashion Accessories. Softlogic and Aditya Birla brought Peter England leading men’s apparel brand of Europe to Colombo now. 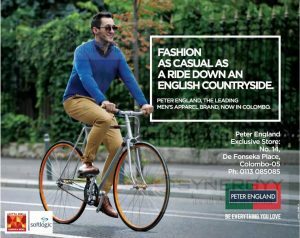 Now enjoy a fashion as casual as a ride down an English countryside, with the comfort of the Peter England. Softlogic open its exclusive store for the Peter England at No. 14, De Fonseka Place, Colombo-05. visit Peter England show room today and enjoy range of new clothing at an affordable price. for more details about the availability and introductory offers contact to Peter England showroom on 0113 085085 or see below image. 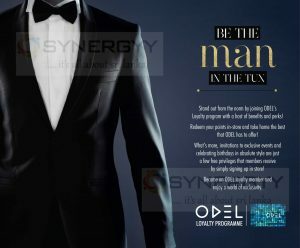 Stand out from the norm by joining ODEL’s Loyalty program with a host of benefits and perks! Redeem your points in-store and take home the best that ODEL has to offer! What’s more, invitations to exclusive events and celebrating birthdays in absolute style are just a few free privileges that members receive by simply signing up in store! Become an ODEL loyalty member and enjoy a world of exclusivity. Rithihi style of expression brought you a pure beautiful Anavila label. The Anavila label communicates one philosophy – pure is beautiful. Anavila is constantly reinventing pret with organic weaves to build a sustainable system Rustic yet functional; minimalistic yet edgy, our modest styles remain timeless. Comfort comes with luxury when one wears Anavila. 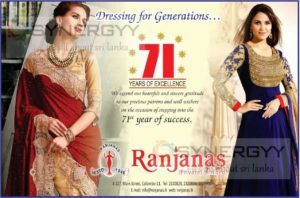 We Ranjanas extend our heartfelt and sincere gratitude to our precious patrons and well wishers onthe occasion of stepping into the 71st year of success. Vogue Jewellers announces a special promotional discounted price for Diamond and Gold Jewellery in this festive season.